Description: Routing does not take the shorted way to a charger/waypoint but routes to an additional charger 25km away and back. So in this plan, the charger at "Kaufland" is selected and after that "Pforzheim Nord". The shorted way would take at the marked crossing in the picture the direct way north. 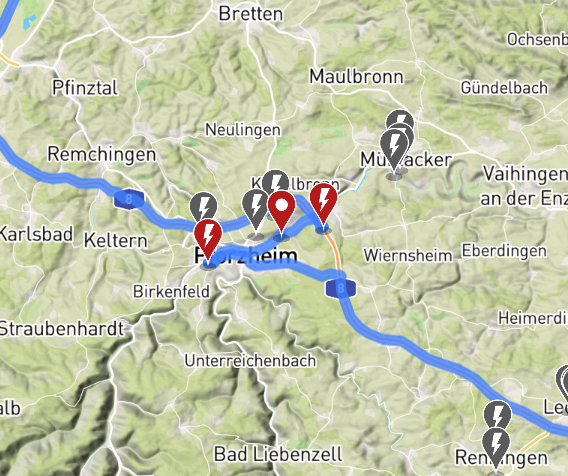 But routing decides to go south, take the Allego charger and then route the same way back to Pforzheim Nord charger. This happens only if the final destination is far away. If it is "too close", routing is correct. Yeah, something has happened to the routing engine. I have a planned trip coming up next month and it was having trouble routing it, kept giving an error or not showing the route, or not showing that it was routing. Now the results are coming back but they are CRAZY different than they used to be. It's got me driving all over the country taking may more days and visiting tons of chargers to make this crazy drive. If I zoom out it's easier to see. I also X'd out all the chargers it has me visiting for no reason, perhaps it's not days longer but it is quite stranger. This is my first time reporting a bug this way. So what happens? It doesn't appear too many people get their questions answered this way. But I wasn't really getting them answered via email either. Rest assured we do check these threads, though both Bo and I have day jobs so it's often a little while between when we can check on these bug reports. Bo's also on a work trip this week, so if you sent these bugs to him, they're probably still sitting in his inbox. I'm really not sure why it's taking that route, but all those charger stops are entirely unnecessary, you can make it from the first to last charger without any stops at all. I've added this to our issue tracker and we'll spend a little time trying to figure out why it's taking that route. 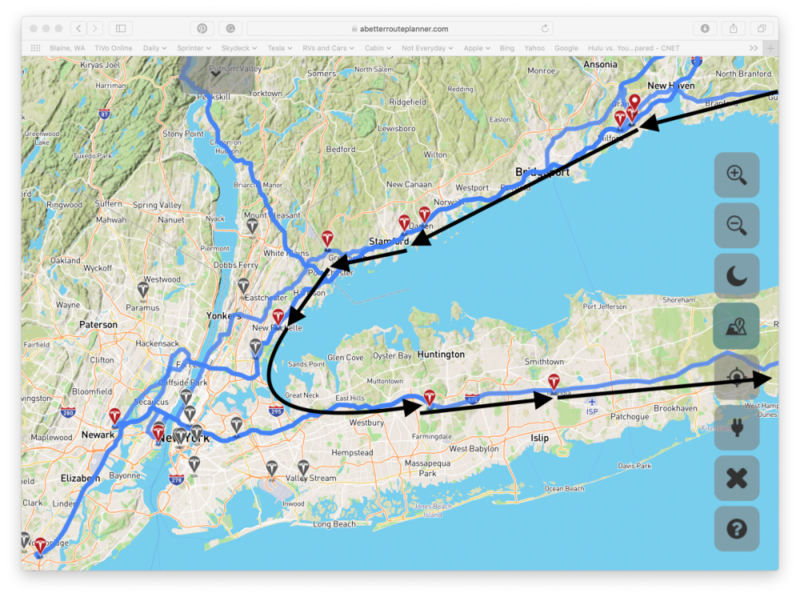 In the meantime, an easy workaround (if you intend to actually drive this route) is to start driving with live data, and then when you deviate from the planned route it'll offer to replan from your current position. Then once you're replanned, it'll be forced to take the route you're currently driving. @israndy - can you post a plan link to the plan you have screenshotted? It makes it a lot easier to investigate. Yes, of course, sorry. But while I am mentioning it, what happened to the Plan Route button? It used to change to Cancel Planning or something, and that animation comes up, but it's below the position the window is open to, the only indication that you actually pressed the button is the scroll bar gets a little smaller. In the meantime, an easy workaround (if you intend to actually drive this route) is to start driving with live data, and then when you deviate from the planned route it'll offer to replan from your current position. Then once you're replanned, it'll be forced to take the route you're currently driving.